THE SEASON OF LOVE IS COMING! Our first Paper Bloggers Unite! Blog Hop is THIS weekend. Saturday morning, we will all have some cool projects to inspire your Season of Love! Some of us - me included - are offering Blog Candy to one randomly selected person leaving a comment Saturday or Sunday. This is mine. There are 6x6 sheets of Stampin Up Real Red card stock, The Paper Studio Be My Valentine paper and 4x6 sheets of SU Very Vanilla and Pretty in Pink card stock. You will also receive these two adorable Season of Love clear stamp sets, pink buttons, red bling (my husband said they'd make great blood drops! ), and heart-patterned ribbon - all from Studio G! So come on back Saturday or Sunday for your chance to win this AWESOME Blog Candy Prize Pack! PLUS... as coordinator, I'll be drawing a name from ALL the comments from ALL the blog participants for a Special Prize Pack! So two chances to Win! 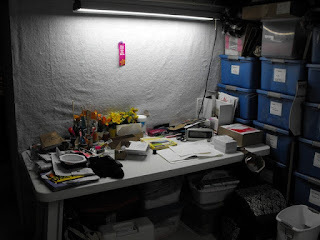 I didn't realize until I began clearing off the cutting table that most of what I had sitting in the middle of it were all the things I took out of my Polymer Clay tote when I was working on that article in December. I had to empty it so I could photograph the amount of space the tote had to offer. Once I put that stuff all away, clearing the rest of the table off was easy. Bob hung my temporary peg board. and put a screw in the floor brace above so I could hang my cutting mats. The grey one hanging in the front is what I put down when doing paper/ mixed media stuff. My good quilting one hangs behind it. I say temporary because I think I want it to come down to just below the edge of the cutting table. But this is what we had on hand and allowed me to put stuff away. We can always do a bigger one later. It's not perfect but it's better. At least I can get to the cutting table for all of the paper crafting I HAVE to get done by Friday afternoon. I know there will not be a Teapot Tuesday this week. We are due for storms all day tomorrow so I'll be lucky if I get on. 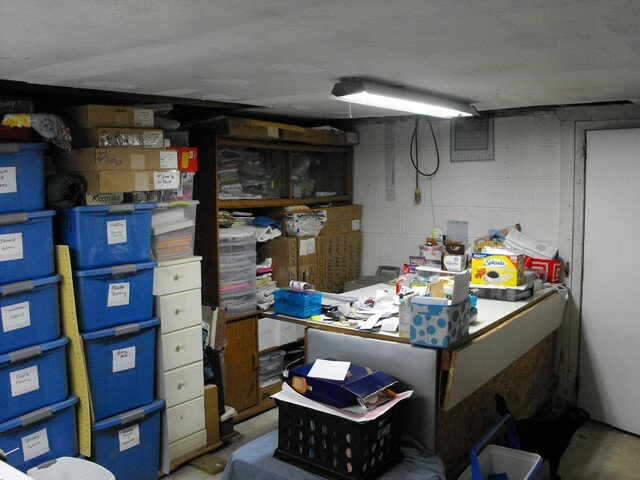 In the mean time, I have plenty of stuff in the basement to keep me busy. Well, hope my pics from yesterday didn't scare you too much. I promise, today's are not as bad. This is taken from the doorway looking towards the cutting table. The entertainment center in the back corner houses all of my quilt kits. Right now the cutting table is full of Mixed Media art stuff and the blue and white basket on the corner is card kits from a group I belong to on SCS. It's imperative I get this all organized as it is my turn to send out envelopes to the other 11 participants on Feb. 1st. Eeeek! Don't let the tubs scare you. That is how I store my large pieces of fabric by type. It keeps them dry just in case we get another torrential rain. The white cabinet holds my SU fabrics, books for mixed media projects and book pages I've removed from previous projects. The clear tub on top of that is my paper maker screen and supplies. Let's look at the cutting table. For those of you who've not heard, this was something I designed and my dear husband built for me over 25 years ago. The 4 legs are 4x4 posts then it's all framed in 2x4s and 1/2" plywood. Then we laminated it in a cream counter top laminate. If you look on the long side (right) you'll see a drop leaf. There is one on each long side. When they are up - the top measures 4'x8'. Then there is a drop leaf on the end that is 2'x2.5'. Initially this was created as a dining room table for the farm house we lived in right after we were married. With all the leaves up, we could comfortably seat 12 people. And talk about counter space for major baking projects! The front side is solid but the left side is a set of cabinets. A top shelf that runs the full 4' length of the cabinet for large cookie sheets and bigger items, then 3 cubby cabinets for storing mixing bowls and misc. baking supplies. Now it houses sewing supplies and gives me plenty of space to cut and play. I've padded and covered this one in an ironing board fabric for quick pressings jobs. 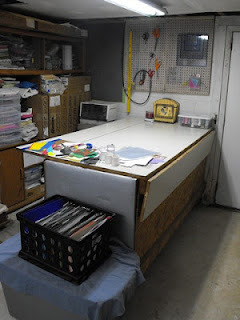 I want to use that right hand side to hang my quilting rulers and mats. 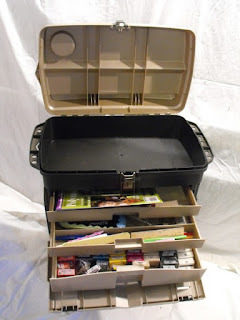 My plan is to cover it with a partial sheet of peg board and the shortest hooks I can find. ... to any project is getting organized. Before I can work on any of the daily projects from my GOAL list, I need to get the Studio back in order. So today, I thought I'd share a few horrific pictures with you and let you join me as I dig my way out. 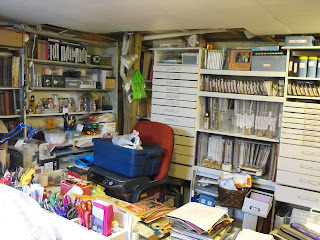 This is the view of my office/ studio from the doorway. Can you say DISASTER! And it is worse than it looks if you are standing amidst the piles. Once I get in there, it won't take long to put stuff in order, it's just been making myself take time away from the writing to do so. The book case in the far back corner is all books I want to read and pass on this year. I've not counted. 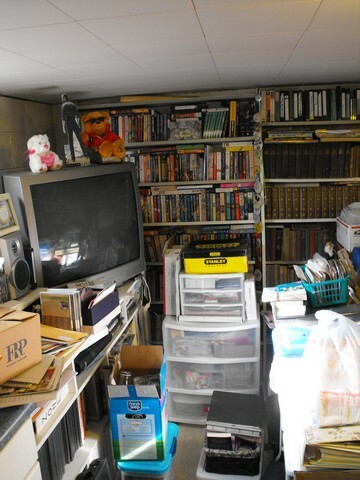 But if I can free up that shelf, I can unpack my 'keepers' - thus emptying a tub in the basement. The next shelf to the right is my vintage book collection. I really wish I had someplace better to store these and I'm working on that. The cabinet the TV is sitting on is full of all my research books. I write fiction and have a list of historical fiction pieces I want to write so I've accumulated a vast amount of material on various points in history. On top of the cabinet I have my PS2. The game I keep trying to make time to get too. But it's there when I'm ready. You can also see stereo speakers. We've discovered the only thing that works on the dual cassette/ cd/ stereo is the radio part. So that will come out. But you can bet I'll have something to fill that space in a hurry. The entire stamping space takes up approximately 80 square feet. That's a lot of space... when things are organized and put where they belong. 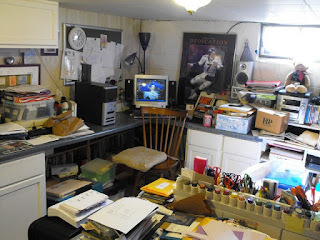 In the chair underneath the blue tub is a Epson photo printer my husband picked up at an auction. Everything is there except ink cartridges. When we priced those out, we discovered it is cheaper for me to get my prints done at Walgreens when they have a print sale. So not sure what I'm doing with that. Anyone want a printer? Oh, and the tub goes back to storage at the end of the month. It is holding my bathroom towels/ wash clothes until time to take down my snowman display in the bathroom. Finally, for the Studio portion.. this stack is a hodge podge of things that just need figured out. I had started collecting the Starbucks bottles when I thought we would be building my new studio this spring. I saw a room partition display in a magazine I wanted to do. Well, I won't be doing that any time soon so not sure what I'm doing with the bottles. 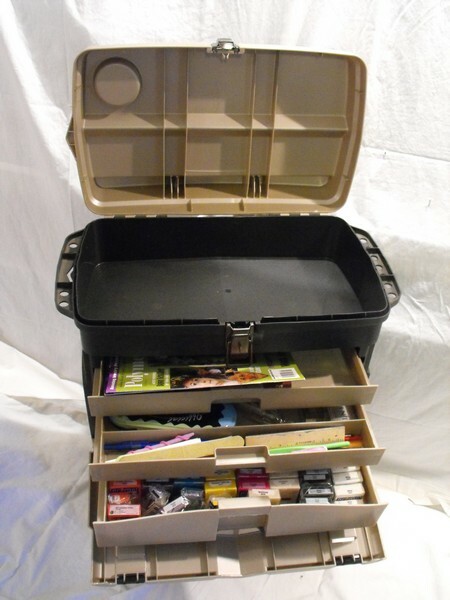 The litter case boxes were to be used in place of gym baskets on the shelves. Nope, won't need those either. Those will go to recycling next week. The plastic cart is full of memorabilia, papers and embellishments to use in Adrian and Abby's scrapbooks. 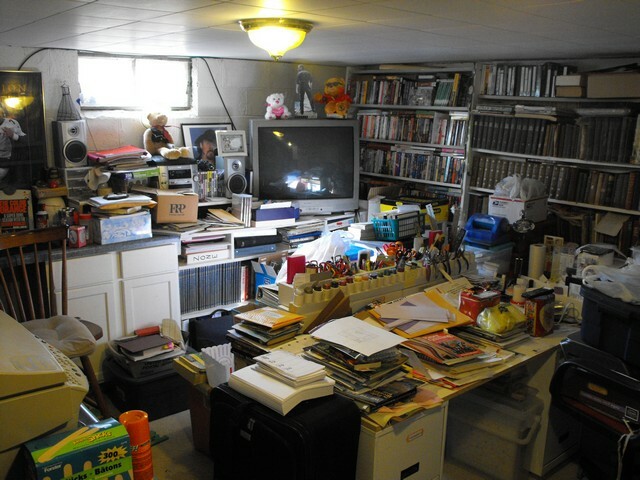 So yeah, if I work on my GOAL list, then this should get emptied and need a new home by end of the year. 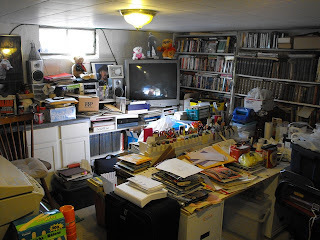 Last pic on my list is of the writing corner of this room. I'd love to replace the monitor with a flat screen, however the tower has been acting up so I'm not sure replacing it is even worth the expense at this point. I'll just work around it. for now. So that's the scary office/ studio combination and my project for this week. Maybe for Friday's post I'll have a surprise for you. Because until I get this done, the weekly schedule just is NOT going to happen! What does your space look like? Leave a comment and link me to pictures of your creative space... good or bad! As I don't have my space cleared out yet, I didn't participate in Teapot Tuesday this week. But I am looking at what I need to do in 2013 to get out of this creative hole of quicksand I seem to be sinking deeper and deeper in to. While watching TV with Bob the other night I made a list of what I want to accomplish this year. I am a LIST person. Also, a very visual person. So I figure if it's in front of me, I might actually accomplish something. That's why I've posted my list on the sidebar of the blog. It will be in front of me on a regular basis. I've broken my tasks down into categories. Christmas is one of the categories with specific projects with a definitive time-line. Our local bank has a Mitten Tree every year. They collect hats/ mittens/ scarves/ socks the three weeks between Thanksgiving and the Christmas break. A day or two before break, the items are taken to the local grade school. I've purchased several pairs of gloves and a few hats on the seasonal clearance sales. I plan to put them all into hat/ scarf/ glove sets. For some of them all I need to add are scarves. Some of them will also use hats. Doing this also gives me the resource of using up some of my excessive yarn stash. I want the tub out the work room. It's time to finish this project. I haven't counted what I have on hand, but I'm estimating approximately 20 sets I need to finish by November 1st. I also make my own Christmas cards. I have already set up my new card box complete with updated addresses I'll need to insure I have 100 cards ready to mail by Thanksgiving. Finally, under the Christmas list are the 10 scarves I want to make for the members of the Polish Sinfonia from Krakow Poland. Traditionally, while they are on tour here (covering 3 south central states), they eat all of their meals in church basements and local restaurants. If all goes according to plan, I will be hosting a traditional Christmas dinner (buffet style) for these amazingly talented young people. One of the things I want to have is a Christmas stocking for each of them filled with gifts. A handmade scarf will fit nicely in the toe of the stocking. For the rest of my goals, I want to complete two of the mixed media projects I didn't complete last year as well as three basic scrapbooks. I figure if I can accomplish these goals, 2013 will be a very productive year! What Creative Goals do you have for 2013? 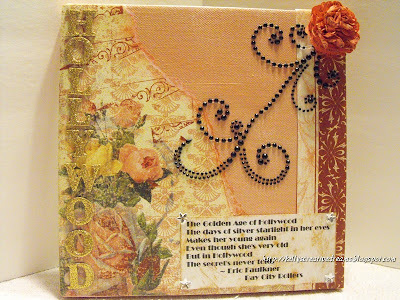 Welcome to the first Mixed Media Monday projects for 2013. I created this Altered Canvas project for a friend for Christmas. We share a love for classic Hollywood movies, primarily the old black and whites when Hollywood movies were full of song and dance numbers from greats like Bing Crosby, Fred Astair, Ginger Rogers and Judy Garland. My jumping off point was the chorus from a song written by Eric Faulkner - Shoorah Shoorah For Hollywood. The previous link will lead you to a YouTube of the song. If you grew up as a teen in the mid-1970s like I did, you probably heard of The Bay City Rollers. I had a huge crush on their lead singer, Les McKeown while my BFF from high school got wide-eyed at the mention of singer/ guitarist Eric Faulkner. I applied a base coat of white Gesso to the 8x8 canvas.Then I mixed Satin Cream & gloss Real Brown from Apple Barrel with HiLite Flesh from Americana and Reminiscent Rose from Anita's until I had the dusty vintage rose tone I wanted. It picks up the blush tones of the rose image in the Rosewood DP by ColorBok. I used adhesive glitter letters from Recollections to spell HOLLYWOOD down one side. The scalloped-circle handmade flower anchors the black adhesive rhinestones from Recollections raining in from the upper right corner. I love how this turned out and my friend loved it! It's taking a prominent place on a shelf below her poster of Marilyn Monroe... a true icon of classic Hollywood... and an example of the tragedy Eric's song laments. Yes, I know we're into 2013 by two weeks already. After working most of December (yeah, my month off didn't really happen) I just needed to crawl into the new year. But, the turtle pace has given me time to think about how I wanted things to go this year. I haven't totally mapped out where we will be on some of the days but I do know, beginning today, Monday's will be MIXED MEDIA MONDAY. I'm still planning on TEAPOT TUESDAY, Wednesdays will be WANDERING WEDNESDAY. Thursday and Friday I'm still working on. I want to definitely want to SCRAPBOOK more this year. The only change to the above mentioned days will be that during the FIRST WEEK of each, I'll showcase the cards I'm mailing out for Birthdays/ Anniversaries that month. And the 25th of each month will showcase my newest Christmas Card. So if you didn't get your Christmas cards done early in 2012, join me on the 25th of each month for Christmas Card Inspiration. If you've not done so yet, click the SUBSCRIBE button on the right and my blog post will come into your email every day. You won't miss a minute of creative inspiration. You will still be able to come back here and post a comment, but at least you'll know when I've updated... which I intend to do on a regular basis this year. At least that's the plan.